Stainless Steel Pipes, Greece, Attica | Metallourgia Mandras S.A. Since 1965, founding year of the company, METALLOURGIA MANDRAS S.A. did not stop to invest constantly in the production of new products in order to develop and strengthen its presence in the drilling pipe manufacturing industry. Coming from a long experience in the field of manufacture of steel drilling pipes, METALLOURGIA MANDRAS S.A specializes now also in the manufacturing of stainless steel drilling pipes. In stainless steel AISI-SAE 304 (ISO A2), the higher the nickel content, the greater the corrosion resistance. In stainless steel AISI-SAE 316 (ISO A4) there is even a higher resistance to corrosion, because the molybdenum content is up to 3%. 1) The stainless sheet steel used for blind pipe manufacture is AISI 304 or AISI 316, 3-6mm wall thickness, in single pieces up to six meters. 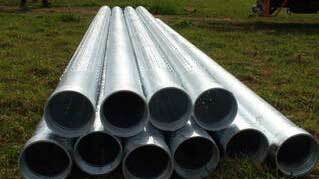 The pipes are measured in accordance with API 5A. 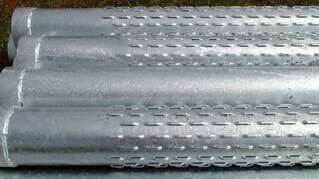 Blind pipes are longitudinal HF – EN10296-2 or MIG-EN 10217 welded. 2) The bridge slotted screens as per DIN4922 or oblong slotted screens are made for longitudinal HF or MIG welded pipes. 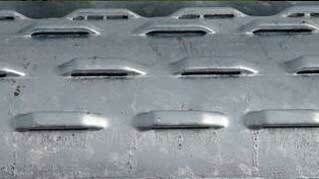 The stainless sheet steel is AISI 304 or AISI 316, 3-6mm thick in single pieces up to six meters. The pipes are measured in accordance with API 5A. The filter’s bridges and slots start from 25cm from the welding point of the female connector and 20 cm from the welding point of the male connector. The opening of the bridge is 1,00 m/m to 3,00 m/m. Diameters 4 ½”, 5 1/4 ”, 6 5/8, 8 5/8, 10 ¾, 12 ¾ ,14’’, 16΄΄, 18΄΄refer to external diameters without the filter or slot of the pipe. The free surface is at least 10% of the filtered segment. 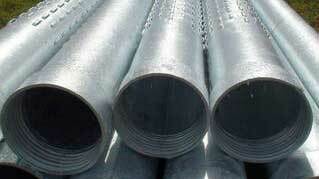 3) The connections of pipes and screens are manufactured under European specifications for stainless steel flat bars. They have semicircular thread with 2 coils/inch and a depth of at least 70 m/m from the edges. Their length is at least 100 m/m to 120 m/m and their thickness from 12m/m up to 15 m/m.